Wayne Levin is part of a group of engineers, statisticians and programmers who are passionate about expanding the use of statistical methods to improve productivity, quality and yields. That group is Predictum, and Wayne is president. How exactly does Predictum help companies improve productivity, quality and yields? "We do this in a variety of ways but almost all of it involves JMP and SAS or the integration of the two, as we did in creating a virtual lab for The Goodyear Tire & Rubber Co.. We're really pleased with these tools as they let us create innovative solutions to challenging client needs," Levin says. I know Wayne and his group have been involved lately in creating JMP add-ins. So I asked him to talk about that specifically, as well as a couple of other distinctive ways that Predictum, a JMP partner with offices in Toronto and Austin, TX, helps people understand and take advantage of the value of analytics for boosting productivity in all types of organizations. Arati: JMP add-ins are a big interest at Predictum these days. Why is that? How are add-ins helpful or important? Wayne: Add-ins are a great way to customize and extend JMP. We have developed several utilities that are common within an industry, such as semiconductors, including STDF importing and wafer mapping, or common across all JMP users, like exporting to PowerPoint and PDF. 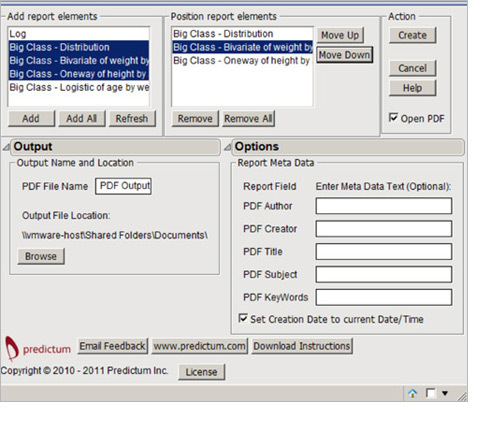 The add-in architecture allows groups like Predictum to meet the needs of JMP users. Arati: You offer a couple of free JMP add-ins on your website. What do they do? Wayne: You are thinking of our PowerPoint and PDF export add-ins. These two formats are so popular that it's no wonder we've heard this requested many times. The PowerPoint export allows JMP users to take their analyses directly out of JMP and place them right into PPT format. No more cutting and pasting. The PDF export goes beyond simply printing to PDF. You can select from among your open reports those that you want to export, sort them and apply PDF properties such as author, title, subject and keywords. We've been pleased with all the appreciative feedback we've received from JMP users around the world. I should point out that very often we take the functionality of the add-ins and incorporate them into larger systems. For example, we are again incorporating our PowerPoint add-in functionality into a sophisticated dashboard for a major semiconductor company. The PDF export functionality has found its place as the last step in analytical workflows at life sciences companies. Arati: Are you working on any new JMP add-ins? Wayne: Oh yes, all the time. Right now we're taking our PDF and PPT add-ins to 64 bit as we get this request all the time. But we are also adding new ones. You can sign up to be on our announcement list at the lower-left of the Predictum home page. That's the best way to stay informed about what new add-ins are available and updates to current ones. And we would like to hear how we can improve what we are currently offering and what new add-ins to create. Anyone interested can send a note to info@predictum.com with their ideas. Arati: What are the Dynamic Illustrations that you have for free download on your website? Wayne: Just about everyone learns concepts faster by engaging with them. These illustrations do just that: They allow those new to statistical concepts to engage with important concepts like Power and Variability. They can see the effect of increasing sample size and learn what alpha is all about, interactively and visually. These tools have allow students to grasp these concepts much faster in training so we continue to enhance them. Wayne: No emergencies as yet but certainly situations where this service has been a big help. I would love to know how you handle paging and very wide reports. Dave: I am the developer of the PPT addin. Paging is handled differently in the PDF than the PPT addin. We use an algorithm that attempts to intelligently split the graphics into portions that will fit properly on a slide. We are currently improving this proprietary algorithm to be included in the soon to be released updated versions of the addins.